Q: What vaccinations must our cat have ? A: Your cat should be annually injected against Feline Flu and Feline Infectious Enteritis. We require proof by way of a vaccination card that your cat has received these injections. If you are in doubt please contact ourselves or check with your vet for the necessary records or advice. We cannot accept any cat that is not fully vaccinated. Q: What will our cat be fed ? A: We feed an extensive range of Royal Canin premium complete foods with either a Whiskas or Felix compliment. We will feed your cat a food suitable for it’s age and condition. Unless otherwise instructed your cat will be fed twice daily. Drinking water is always available. Q: Our cat only likes a few flavors of tinned food. A: That’s not a problem. We stock six flavors of Whiskas and five flavors of Felix and so we are bound to find one that meets with your cats approval. Q: Our cat will not eat any of the above or has a special diet. A: You are more than welcome to provide us with another diet for your cat which we will feed as per your instructions. Fresh meat diets need to be cooked and frozen in daily portions. Q: Our cat is receiving medication. Can they still board with you ? A: If your cat is receiving medication for a non contagious/infectious condition they can still board with us. Our experienced staff will continue to administer the medication as per your vets instructions. A: Our experienced staff have good knowledge and experience with homeopathic medicines. We can continue the treatment for you, storing and handling them in the appropriate manner. However, being more time consuming and labor intensive we do make a daily charge for administering these remedies. We will also accept cats protected with homeopathic nosodes accompanied with a veterinary certificate. Q: Can we bring our cats bed ? A: You are more than welcome to bring bedding from home as this helps settle your cat with a familiar smell. We do provide a heated fleece lined igloo bed which cats begrudge giving up when they leave us, so please restrict bedding to a reasonable amount and size. Please also feel free to bring along scratching posts and toys etc. Q: We have more than one cat – can they board together ? 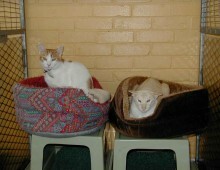 A: We are able to provide two heated beds per pen, so cats from the same household may share. For multiples of two we can house them in adjacent pens. Odd number of cats sharing depends upon cats sharing the heated igloo. If you know your cats will sleep together we can put three in to a pen. If not we recommend putting them in adjacent pens so that they benefit from the heated sleeping quarters. Q: What happens if our cat falls ill whilst they are boarding with you ? A: Should you cat fall ill whilst in our care we will arrange veterinary care. We will contact our regular veterinary practice (Donnington Grove) unless you request that we contact your own practice. All treatment up to the value of £500 will be covered by our veterinary insurance unless it is a known condition. Your cat is covered by our insurance for up to 72 hours after leaving our care. Q: Our cat does not like dogs ? 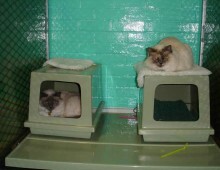 A: The cattery is a completely separate building that is situated away from the kennel blocks at a lower level. Our reception forms part of the cattery building, into which dogs are not permitted. Therefore your cat will never come into contact or be disturbed by dogs. Q: We would like to see your cattery for ourselves ? A: Cattery standards, designs and premises vary greatly, and so we strongly recommend that you inspect any facilities that you are considering using. 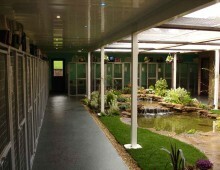 We are very proud of our cattery facilities and we will be delighted to show them to you. The cattery can be viewed at any time during our opening hours. No appointment is necessary.